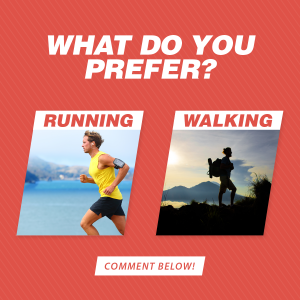 Home » Uncategorized » Do you prefer walking or running massage helps! Do you prefer walking or running massage helps! Both sports are actually very good for you. Contrary to what you hear about running that it’s bad for your knees. Actually it has now been scientifically proven that it actually strengthens your knees. Like with any exercise start of little and often. So with running you would run for 2 minutes and walk for 2 and you would boost this up into 30 minutes of exercise followed by 2 weeks time pushing your self to do or add 15 minutes on top. Did you know that walking is so good for you also for mindfulness reasons. Running is more intense and great for cardio workout and you can cover more miles with running. You also burn more calories due to the heart working faster. Walking and running helps with boosting the core muscles which are responsible for your back muscles and can help back pain. It is great for depression, stress and anxiety. Did you know doing either can help with just 20 minutes of exercise and help with your mind? It is like doing meditation but whilst you are about in nature. Improves lung function, heart, cardiovascular, mood,immune, posture. I like to offer sportsman Sports massage that can aid there workout before and after. Most people will forget to stretch or not hold there stretches for so long. Which when doing any sports you should stretch before and after. Drink plenty of water and like with massage a very light diet before and after.